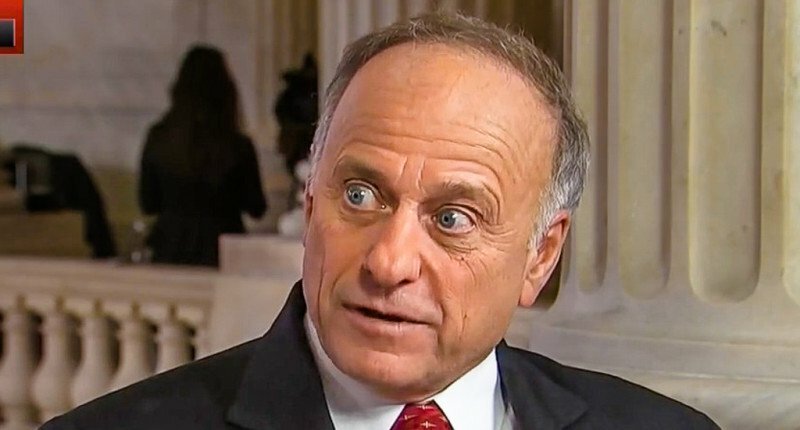 Noted racist congressman Steve King (R-Iowa) may finally face consequences for being an open white supremacist and anti-Semite. Who knew there would ever be a line this guy could cross? He's gotten away with it forever. House Republican leaders are reportedly trying to remove Steve King from the Judiciary Committee and his other panel assignments on Monday night, after his latest pro-white supremacy remarks. King is an ally of Donald Trump on the racist border wall, an idea which King has touted for longer than Trump. King has been saying awful things about immigrants and anyone who isn't white forever. As recently as last November, “top Iowa Republicans like Senator Charles E. Grassley endorsed Mr. King for re-election even after a House Republican denounced him as a white supremacist,” the NYT reports. Guess that was kind of offensive. House Republican leaders will try to remove Representative Steve King of Iowa from the powerful Judiciary Committee and his other panel assignments on Monday night as the party officials scrambled to appear tough on racism and contain damage from comments Mr. King made to The New York Times questioning why white supremacy is considered offensive. Mr. King’s own party leadership moved against him throughout the day, with the Senate majority leader, Mitch McConnell, suggesting Mr. King find “another line of work” and Senator Mitt Romney saying he should quit. In an attempt to be proactive, the House Republicans stripped him of the coveted Judiciary and Agriculture Committee seats in the face of multiple Democratic resolutions to censure Mr. King that are being introduced this week. Those measures will force Republicans to take a stand on whether to go along with the House Democratic majority’s attempt to publicly reprimand one of their own. Representative Kevin McCarthy of California, the House minority leader, conferred privately with Mr. King for an hour on Monday afternoon. Mr. McCarthy called a special meeting of the Republican Steering Committee on Monday night to consider removing Mr. King from Judiciary — which has jurisdiction over immigration, voting rights and impeachment — and Agriculture, which is a prized committee for Iowans, according to two Republicans familiar with the plans. Democrats @RepBobbyRush @RepTimRyan have just given notice on the House floor of resolutions to censure Steve King for his racist statements. Here's what Jim Clyburn is gonna say on the House floor tonight re: the resolution of disapproval on Steve King's white supremacy comments.